Skrill is a payment provider that allows you to securely pay for Skype products. You can use Skrill to pay by credit card, debit card, bank transfer or your Skrill eWallet account. If you have paid for a Skype product using Skrill before, you will be able to make on-demand payments using Skrill for your future Skype purchases. This means that every time you buy a Skype product, you will be able to pay for it using Skrill with just one click. You can use Skrill to make one-off payments for any Skype feature, or you can use our Auto-recharge feature to make a purchase using Skrill, to ensure that you never run out of Skype Credit and can make calls when you want to. Read more about choosing Skrill as your method of payment. Visit Skrill* to find out how to open a Skrill account (free of charge). *Skype is not responsible for the content of external sites. Sign in to your Skype account, then select the Skype product that you want to buy. Enter your billing name and address, then click Next. Under payment options, select Skrill. Enter your details, select your preferred payment type (credit card or bank transfer), then click CONTINUE. Follow the instructions to complete your purchase. Sign in to your account, then select the Skype product that you want to buy. Under payment options, change the payment method to Skrill. Click Change under the Paying with section displayed on the right side of the screen. Select Skrill as your payment method, then click Continue. A summary of your order is displayed. Click Next again. You will be directed to the Skrill website. If you interrupt the purchase process, you will not be charged and your order will not be processed. Next time you sign in to your account, the purchase will resume. Log in to your Skrill account. Choose the Skrill payment method that you want to use, enter any information requested on-screen, such as your credit card details, and click CONFIRM. Confirm authorization to debit this and future on-demand payments from your selected Skrill payment method. 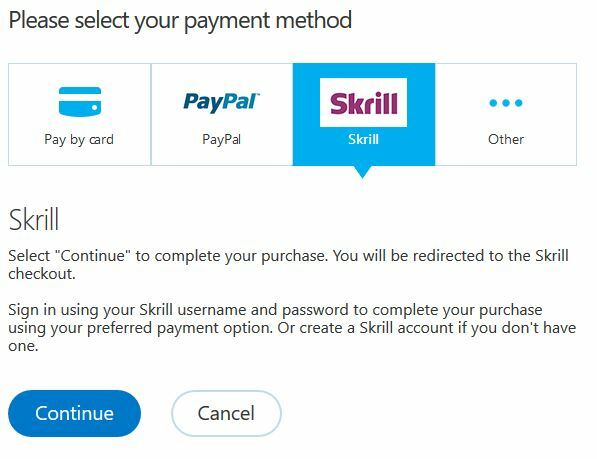 Important: The payment method that you have selected determines where your future Skrill on-demand payments to Skype will be taken from. 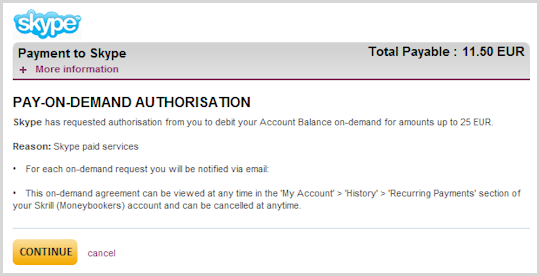 So, if you selected Pay from my balance, your future on-demand payments will be taken from your Skrill account balance. If you select Use a new credit/debit card, your future on-demand payments will be taken from the credit or debit card entered here. However, if you select another payment method, future Skrill on-demand payments will be taken from your Skrill account balance. On-demand payments cannot be taken from your bank account (unless the account is German) or from American Express (AMEX) cards. If you selected one of these methods, make sure that your Skrill account balance has sufficient funds to cover any on-demand payments that you make in the future. If you need to change your Skrill on-demand payment method, all you need to do is repeat the above steps, ensuring that you select the new payment method required. This will cancel the old on-demand agreement and a new one will be set up. Click CONTINUE, and then CONFIRM to make your payment and set up Skrill on-demand payments as your ongoing payment method. The next time you buy a Skype product (assuming you do not change your payment method), you can pay it with just one click. Just sign in to your Skype account, select the Skype product that you want to buy, and click Buy now to complete the payment immediately. Select the Skype product that you want to buy. Click Change under the Paying with section displayed on the right side of the screen. Select the Skrill (Moneybookers) payment method displayed under Pay with your stored instruments, then click Next. Check the amount displayed, then click Buy now to complete the payment immediately.